Pet Diabetes - What Will It Cost To Treat A Diabetic Pet? When your pet is first diagnosed with diabetes mellitus this is a question that comes up. This is what Jake uses every month! This webpage will try to give you the basic costs of maintaining a diabetic pet. 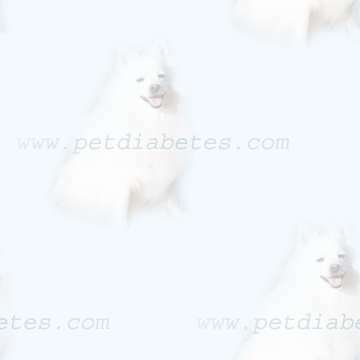 of the Pet Diabetes Email List to submit their costs for this page. 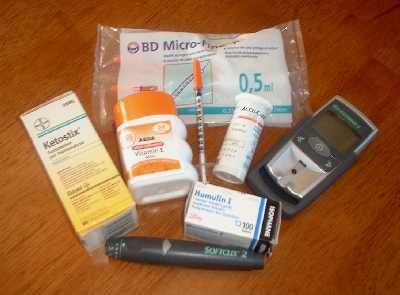 Differences in Prices will reflect that some of us do not home blood glucose test. Some of the products used can be obtained for a lower price by shopping around. I live in Cincinnati, Ohio. I wanted to let you know the cost of my dog, a nine-year-old Yellow Lab Mix named Whitney. She was diagnosed April 27, 2009. She is on 19 units of Vetsulin in the morning and 18 units at night. I think we finally got her regulated although it's possible the insulin may have to be increased a little more. I sure hope not because after 20 units, she would have to receive two shots instead of one because the syringe goes up only to 20 units. The insulin costs $30.00 per bottle and we're using right about three bottles per month so that's $90.00. We check her blood sugar a few times a week so that's $1.00 ($.35 per strip for the One Touch meter) and I feed her Solid Gold dog food at $55.00 for a 33 lb. bag, but I fed her that anyway. I took one look at the ingredients on the Purina diabetic dog food my vet suggested and said no thanx. It had all kinds of bad stuff in it. Solid Gold and other high-end dog foods don't have the by-products, artificial preservatives and colorings, sugar, etc. like a lot of dog foods do. The syringes, glucose machine, and lancets also cost some money initially but I reuse the syringes and lancets over and over by boiling them in water for a couple of minutes to sterilize them at the end of the week after using each one once. If you add those costs in each month, it might increase the costs a little. And lots of trips to the vet in the beginning before I bought my own glucose machine for her. I read a ton of info on the Internet about diabetes, as well as blogs, and educated myself. I slowly increased Whitney's insulin over a two-month period myself. Her blood glucose was in the 350's most of the time and up to 419, and it finally started coming down after two months. My vet had started her off at 5 units, which he knew would have to slowly be increased. You don't want to start off too high or they could end up having hypoglycemia and possibly die or have brain damage. My dog is really a great dog; couldn't ask for a better-behaved one! She's just the best (along with my two other lab mixes!!) It kills me that she has a terrible disease like this, and three months later, I'm still pretty much in shock by it. She wasn't obese (just a little overweight) and I have always taken my dogs out for walks or usually to run in a park down the street for an hour to an hour-and-a-half almost every day so I can't figure out why she developed this disease. (Genetics? Vaccinations?) I don't think twice about spending the money on her because my dogs are my kids to me!! With the initial costs, I'm probably spending $100 a month. Thank you for your blog for people to read about other peoples' experiences and inform themselves. In addition I give her vitamins C, E, MSM, Chromium Picolinate, and herbal supplements Ginseng Complex with Vitamin B-12, Milk Thistle, Bilberry, Aloe Vera every day, Echinacea twice a week, and Oatmeal when needed. It's difficult to say how much these cost total but I do buy them when it's "buy one, get one free." I spend approximately $15.00 a month on these so my total costs for everything related to her diabetes are approximately $115. 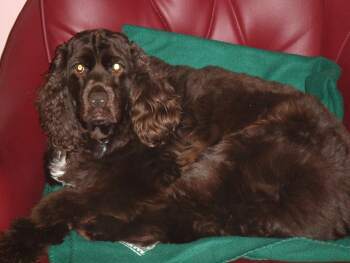 Reese is a 39 pound American Cocker Spaniel, 3 years old. We thought he was a "gonner" 'til we found he was diabetic. Since then he has bounced back, and no longer wants to chew on everyone he meets. He is now a kissing bandit! 12 units twice a day. We use 1 per day, sterilize with alcohol between shots. The love we get in return Priceless! !!! Queenie's costs includes needles, insulin and urine testing. Prices quoted are in Canadian Dollars for Queenie's Costs. But I inject 4 units a day into the air and all insulin can not be used out of a cartridge. This insulin lasts me for 60 days. as I went by the 30 day rule and threw the bottle out after 30 days of use. Cost for insulin is 67 cents a day. Comes in a box of 100 strips. picks them up for Queenie on that day. she is on four shots a day increasing the costs by 43 cents more a day. $10 on a blood sugar test. We have one curve done a year at $80. So we spend approx $65-70 a month and around $860-900 a yr.
We do not do at home testing, so sometimes we might spend $10 a wk on tests. But usually it is just once a month. Adopt a greyhound; everyone's a winner! The picture at the top is Jake's Diabetic Supplies! A box of 50 test strips is £26.00. He charges me £4.60 to write out the script. The discussion about Jakes general health,curves, his weight check and any other information is free. Blood Curves -(anticipate 3 a year) $60.00 so this will add $20.00 a month to the above total. The cost of strips for my One Touch Ultra are 45.00 for 50. Goodness it does add up doesn't it.